We had a birthday party this weekend for my younger son. We had some little friends and their families to join us for lunch and cake. I had set out real glasses to use, but the day was really warm and people were thirsty! We needed extra cups quickly. I resorted to my backup stash of paper cups, since I can compost them. My pet peeve though is how hard it was for me to track down those paper cups! Luckily I had shopped ahead of the party—just in case. At my neighborhood Whole Foods they only sell Preserve cups. I know they are made from recycled material and can be recycled, but it is still plastic. I thought composting would be better. I went to a Safeway to pick up some paper cups and the shelves were stocked with plastic (and it wasn't recycled, mind you) and styrofoam! Luckily, after some sleuthing I was able to find a package of paper cups. If I had the energy to drive to a THIRD store, I know I could have gotten some of the nifty compostable paper cups made from 100% sugar cane fiber. But I didn't have the time to head to another location for one item. 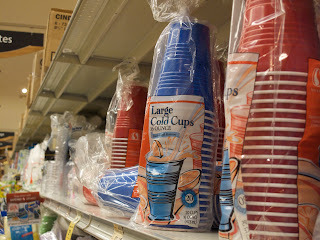 Maybe I could have found decent paper cups at Target, if I had been in one. My question is, why does it have to be so hard to find simple supplies like that? Why are recycled or eco-safe goods not even on the shelves at my local big-chain grocery store? Seems they could carry a few for the random crunchy customers that come by. Grrr. Oh, my! I feel your frustration. We had a birthday party this weekend too. The glass cups just don't hold everyone -- even when we use a crayon to write names on them. But I am happy with our enameled plates and flea-market flatware and homemade napkins with pinked edges. We just wash everything and put them aside for the next event. The drinks remain the big challenge.